Bring peace and thoughtful living to your whole family. Reading with a child is itself an exercise in mindfulness, especially if you take care to notice each sentence and each illustration as the pages turn. The captivating stories below offer incredible opportunities to encourage mindfulness. And for older readers, we also offer lists of chapter books on Mindfulness & Gratitude. Take a moment to notice five new things about the person next to you. Think quietly about your day for four deep breaths. What are you thankful for? Find a peaceful place to sit or walk slowly in nature. Then share observations using all five of your senses (something you see - something you smell - something you feel - something you taste - something you hear). When do you find it most difficult to be mindful or fully able to notice the present moment? When do you find it easiest to be mindful? 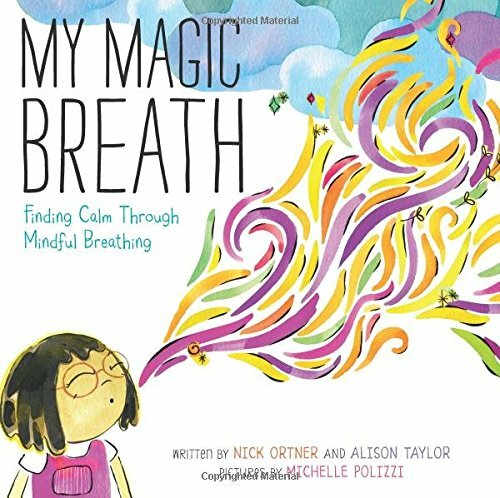 This beautifully designed, interactive book introduces kids to a simple breathing pattern, essential for soothing strong emotions and welcoming in happiness. This award-winning story of imagination and friendship is told entirely through pictures. Enjoy each page silently together for a simple, mindful activity, and share your thoughts at the end. Or invite your child to tell the story to you. Follow Nikolai on his quest to answer three important questions: Who is the most important one? What is the most important thing? When is the most important time? Amid all of this food for thought, your family will cheer for Nikolai as he rescues someone in need. Practice the mindful art of listening to nature with this poetic, whimsical story. Grown ups and children alike will be inspired to spend more time noticing what the world around them has to say. This wonderfully illustrated picture book is more a guided mediation than story. Yet its simple presentation does a wonderful job of showing us all how mindfulness feeds creativity and imagination. You're sure to end the story looking for more ways to bring silence into your life. If you're looking for a straight forward introduction to mindfulness, this colorful book offers a charming foundation. You won't find a story here, as much as a launch pad for your mindfulness conversation. Stillwater the panda shares three ancient Zen stories with his neighbor friends. Each story carries the answer to a challenge faced by one of his friends and, in every case, a challenge we all face at some time or another. These memorable tales are wonderful conversation starters. Even better, they are likely to come up time and again when your children notice similar problematic mindsets come up in their own lives. Let yourselves be carried away by the imaginative poetry of this unusual book. Invite children (and grown ups too!) to act out the colorful descriptions as you become the Earth itself. This book wonderfully accompanies any effort to teach children yoga, take a mindfulness walk through nature, or begin an exploration of the scientific wonders of the natural world. This beautiful book empowers children to discover the quiet places that feed their spirits, including the many adventures that await between the covers of a good book. This last recommendation is a life skills book rather than a parenting book. You'll find creative, practical tools for meditation with children in the book and on its accompanying CD. In just ten minutes a couple of times each week, your family can develop useful mindfulness skills to relieve stress in an anxious child, ward off tantrums, and improve coping skills for your whole family.